in cd player: moby, moby - so nice, it's named twice! my condition: confused, realizing how late it is, and I haven't eaten dinner yet. A couple days ago, I rebuilt Des' hard drive due to a Doublespace glitch (tape backups are very handy! ), which gave us enough hard drive space to install some previously unused kid's software. One is the IntelPlay Sound Morpher software. It comes with a neato little handheld digital recorder, but the software has some other cool tools -- one being a text-to-speech converter. It's pretty low-tech (not even cut-and-paste), but we both had plenty of fun with it. Des' first experiment resulted in the loudest giggles. My favorite is a touch of old-school computer entertainment. All kinds of fun! I'm looking for a use of this software in a future Backwash column, and possibly the outgoing message on my celphone's voicemail. In other news, I just got back from seeing Minority Report. Damn good movie. I've heard complaints about plot holes, but I didn't preceive them...the holes are there only if you base your perception on things the movie later disproves. That's all I'll say. Go see it. Boy, it's been a while, huh? I've been a bit busy over the past week. Destiny and I hung out all last weekend, including going to the Powerpuff Girls movie and visiting cousins & other relatives. Then we went for a bikeride on Monday and to the show at Trollwood on Tuesday, then I had class on Wednesday, and last night we both went to sleep approximately an hour earlier than our respective regular bedtimes. Des is at her mom's this weekend, so I'm hoping to spend a lazy weekend at home, working on a variety of projects (including a new Backwash column hopefully). Second Stage Lensman, by E.E. "Doc" Smith. my condition: I think I've been depressed lately, actually. Nothing serious, just an apathetic malaise which makes me feel like there's not enough time to do anything, so I'll just do nothing instead. Boy, who remembers my first post about selling my car? It was quite a while ago; a lot has hapenned since then. Unfortunately, one thing which hasn't happened is selling my car. In the past few months I've had a grand total of 6 calls on it, none of which resulted in any interest in seeing the car. Apparently, high miles outweighs the fact that the car runs nice, looks good, and has been well cared for. Around a month ago, someone hit my car with god-knows-what, cracking the windshield, ruining the driver's side mirror, and leaving a number of small scratches and dents on the driver's side. Last Friday, I got a call from the Fargo Park District. A friendly guy said that I've had it parked in a nearby baseball-diamond's parking lot long enough, and I'd better move my car. 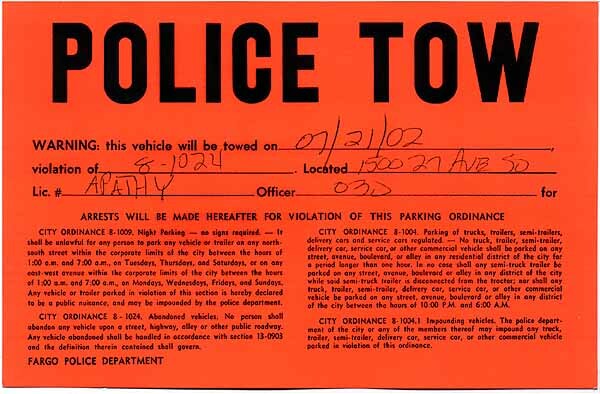 Today, I recieved the warning that I'll be towed if I leave it on the street any longer. I started out expecting somewhere between $3,000 and $4,000 for a nice-running car in better-than-average shape (it started up like a dream, after sitting at the baseball diamond for almost six weeks). Then, I figured I could get $2,500 for a slightly-damaged vehicle (that was before I noticed the windshield crack). Now, I'm expecting to get $600 for it at the monthly auto auction. How's that for a nosedive on an investment? If I'm lucky, I'll make back what I spent on advertising the car; unfortunately, there's no way I'll make back the $1,000 in repairs completed in the past year. If you look in my guestbook, you'll see an entry from Beth, regarding a book I have. She says her great-great grandfather wrote it, and is trying to track down a copy of his award-winning treatise. So, I pulled mine off my shelf and leafed through it. I didn't get very far, only to the inside cover where the previous owner had left his mark. George Wesley Droke. Just for a lark, I put his name into a search engine, only to discover that Mr. Droke was faculty at the University of Arkansas for 47 years, retiring as Dean in late 1924. He grew up in Arkansas, after moving from Indiana, and a school was eventually named after him or his family near Bentonville. See, this is why I love old books. Eighty years ago, this learned man, who grew up in during the Civil War and never attended school until already 13 years old, added this book to his collection. Two years from retirement, still dean of the University of Arkansas, Droke was 68 years old when he signed this book. 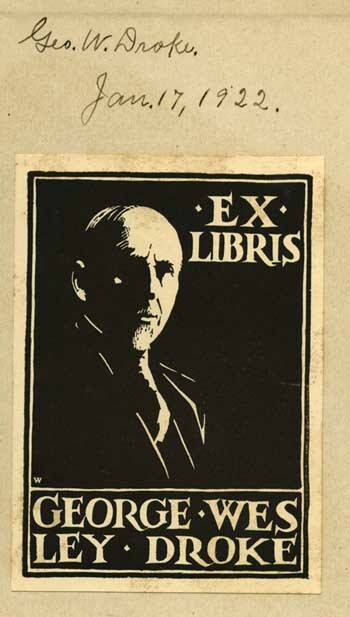 He made sure there was no doubt as to the ownership of the book: he pasted a personalized library plate into the cover, accompanied by a fountain-pen signature and the date. Ownership is fleeting in our modern-day world. Centuries pass, however, and this book will always be Droke's copy. Even if I sell this to the author's great-grandaughter, or if it just stays on my shelf, there's still the weighty impression of a person's life on it. Hey, everyone remember the movie auditions I mentioned a while back? This morning, I was getting kinda worried. I started to think...maybe I should have a monologue prepared, should I have a headshot, what about a resume? I had gotten myself pretty worked up over the audition. Just like I always have done, though. Since nothing's really riding on this, I shouldn't have gotten so excited. Auditions were at 1:00, and Coworker Jason arrived at the same time as me. In the band room, we found a rag-tag bunch of people sitting around a table eating lunch. The producer introduced herself (very young, very very cute) and had us write down our names and email addresses on a sheet of paper. Didn't ask for headshot or resume. Phil, the director wasn't there yet, she said, and he had the video camera, so as soon as he arrived things would get going. There would be a bit of cold-reading, but she didn't really say if she had the script, or if it was with the director as well. The only other prospective actually had a valid acting resume; some screen-time while living in New York, plus some performing around Fargo. Me, I told about my theatre history, while Jason just kept quiet. After 20 minutes, we were dismissed with a "we'll let you know." There are three words in the English language that end in "gry". ONE is angry and the other is hungry. EveryONE knows what the third ONE means and what it stands for. EveryONE uses them everyday, and if you listened very carefully, I've given you the third word. Send it to 5 people and you'll get the answer to pop up on your screen. " So, I immediately responded back, with an explanation of the "gry" solution, plus a warning against believing any email which requires to be forwarded. This is one email which happened to be right. The email was forwarded to five people, and my emailed answer did pop up on her screen shortly thereafter. However, my scolding wasn't met with thanks. One of the email recipients decided that the missing -gry word was "turd-gry," a term newly created in my honor. Every summer, our company sponsors an "outing," to go do something fun. Last year was a baseball game, but this year the votes elected trapshooting as the event of choice. Enough shotguns were rounded up, and we took off an hour early and drove out to the shooting range. I've never fired a gun before. I was actually kinda nervous, because I've always thought guns were a bit scary. Toy guns, like toy monsters, aren't nearly as scary as the real thing, but I've never really been close to a real, loaded gun. Today, I got to pick one up, load the shell and flip off the safety, put it to my shoulder, and yell "PULL!" I blame Nintendo. All those old video consoles had guns and shooting games. I was never that great, but they taught me the concept. I blame photography. I can stop a speeding motorcycle in place, after much practice leading the target, and learning to press the shutter release light enough so as not to throw off my aim. I blame my brother's BB gun, and the BB guns of friends in gradeschool. "You're lifting the gun when you pull the trigger; hold it steady," one friend told me. Today, I fired a gun for the first time. Actually, I fired it 50 times, in two rounds of 25 shots each. In the first round, I hit 16 of the 25 clay pigeons, beating my competition (also beginners) by a wide, wide margin. In the second, I hit 17 of my targets, tying an avid hunter for the best score. So, here I sit, typing at my computer. You know, at last estimate I write a minimum of 3,000-4,000 words a week for the reading public, ranging from here, The Receipt Site, I Am, Backwash, Fark, and a handful of other places under aliases, where the readers have varying ideas of who I am. I write all the damn time. Here's my quandary: how much work should I put into being a professional writer? I've actually been working on a book, but isn't everyone? I've gotten a LOT of positive feedback on my internet scribblings, all of which were written in one sitting, without any editing. Really; I can only imagine what I'd accomplish with a notebook of research and the help of a professional editor. As it is with my "professional" webdesign company, going pro is a lot of work. I just don't have a lot of time; it's a struggle to decide where to focus my efforts. If you've read my past entries, you've gotten the idea that I like public attention for being myself, so there's this yearning to put my efforts into the media, all the way back to my roots in theatre, to today. There's plenty of potential for me to be in the movies, on tv, in print and all around. I'm not out to be a megastar; I just want the public to go "oh, yeah, you're that guy!" when they meet me. Where will I find the time to do this? What I need is a big, 5-figure advance so I can quit my job and devote myself full-time to writing, performing, and designing. That won't happen until I'm established as a professional writer, performer, or designer. My basket is far too full, and the goodies are spilling out because I walk much too fast. We're back from The Lakes. Around here, a large portion of Minnesota is just called "The Lakes;" there's too many to keep track of, even the large ones. My aunt's cabin is on Lake Melissa, maybe 40 miles south-east of Fargo. Fireworks, jetskis, sunfish, swimming, brats on the grill, sunburns, and exhaustion all make for a great 4th of July. I know you non-Americans read this website, but regardless I still expect you to know what the 4th of July is. For as closeminded as us Americans are, you should know better than to ignore our traditions. Anyways, I also have updated Destiny's website. Have a gander. I'm too tired to say much else. When you sign up for life insurance, you're asked to appoint a primary beneficiary, who gets the money when you die, and a contingent beneficiary, who gets the money if the primary is no longer around, either. Smart people update this often, lest your ex-spouse get a $100,000 check to the dismay of your current spouse. As life progresses, so do the files and databases which you're a part of. This is a very odd children's film, and as I watched it with Destiny I was worried she'd get scared or upset at some of the parts. Totoro roars loudly to communicate, and there's a nonexplicit naked bathing scene, neither of which are encountered in a Disney movie. It turns out, though, Des loved it, and I did too. Like most anime, there's a different sense of what's expected in a film, what's allowed and what's required. This one offers no explanation for Totoro, no 'backstory' that American films love, and instead focused on the children's fantasy-life. The family is a realistically loving family, unlike American films which require a dysfunctional family that hopefully fixes itself in the end. My Neighbor Totorois a very visual, cerebral film, yet amazingly accessible for young schoolchildren. Kids are all too often underestimated when creating entertainment, and it's nice to find a film that doesn't second-guess them. This is helped by the fact that the english transation (readily available in video stores) is of unexpectedly high quality. As I left for work today, a cop car passed by. Two uniformed cops were seated in the front, but one, also uniformed, was in the back. He had his window down, and his arm was hanging out like a 5-year old, his flat hand cutting through the air like a wing. Fun from Agency Compile: This is one of the funniest things I've seen in at LEAST the past half hour. When an anthropomorphized colon polyp freaks out, that's comedy GOLD!